You don’t have to know much about Northern Ireland to know that we have murals … lots of murals … I’ve written before about how they act as social barometers, with changing themes and emphases reflecting wider concerns within varies communities. 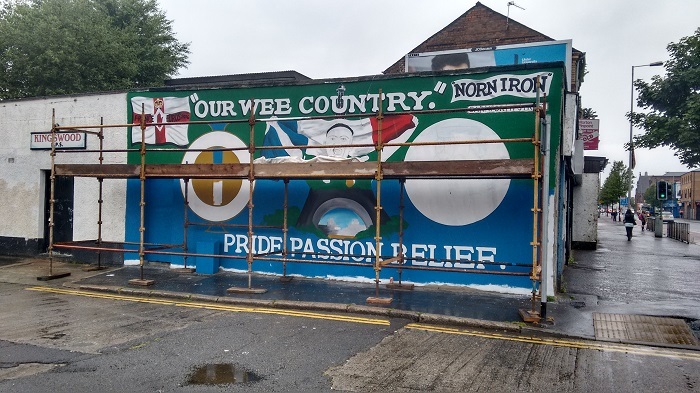 While even a basic Google image search will return plenty of images of Northern Ireland’s murals, I recently noticed that there are relatively few images out there of murals during construction. It’s easy to see why so few such images exist – it’s a relatively short process (a matter of days) in relation to the amount of time they’re visible for (frequently several years). There’s also the issue that – especially for the more sectarian examples - many artists may be reluctant to be filmed or photographed. 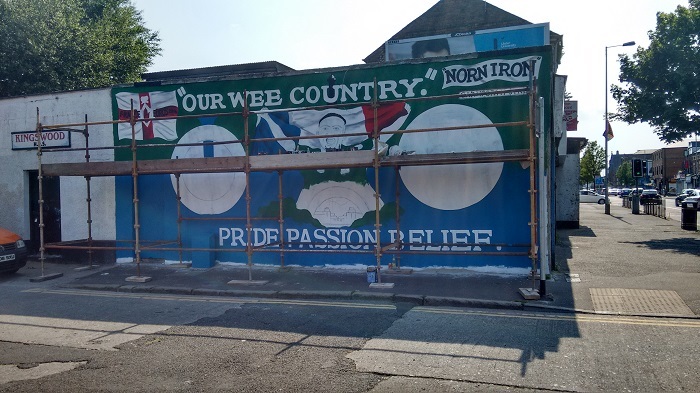 In June of last year, in the run up to the Euro 2016 soccer competition in France, a gable wall at the junction of Carnforth Street and the Albertbridge Road in East Belfast was chosen to receive a tribute to the Northern Ireland soccer team. I passed by there every morning on my way to work and in the evening on my way back home. For the want of anything better than creating a personal record, I took a couple of photos every day and watched the piece come together. I’d rather forgotten about them until recently, when I was having a bit of a clear-out and trying to make some space on a hard drive. I present them now for what they are. 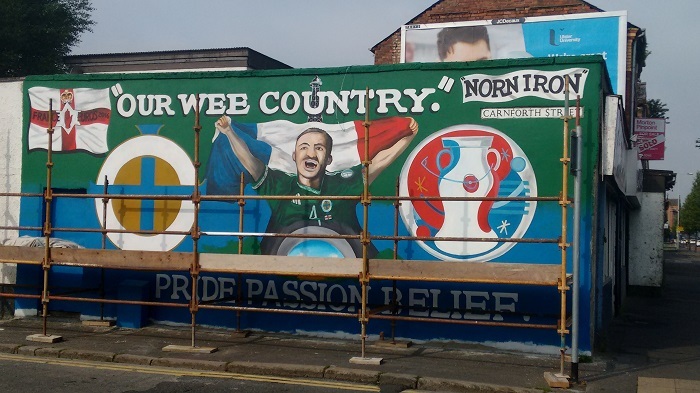 The mural is not high art – but, then again, no one ever claimed it was. In every sense, it is a piece of contemporary folk art. 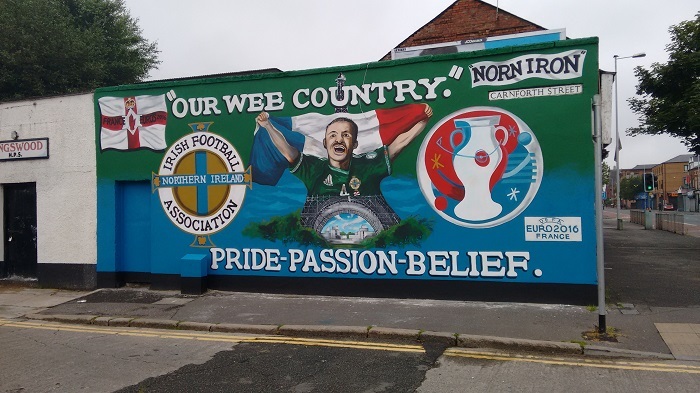 Perhaps naive and unsophisticated in composition and technique, but it still conveys passion for the team at having secured a place in a major competition. While they never made it out of their Group, losing to Poland, Germany, and Wales (though they did beat Ukraine 2-0 … sorry Sergey! 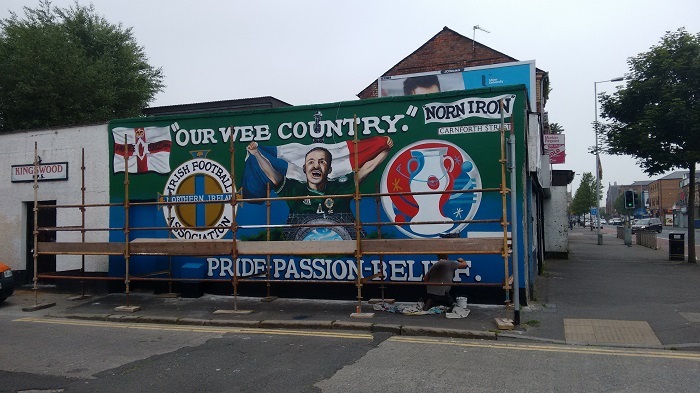 ), the mural is more about the joy and support of the fans. In any event, recording this piece of ephemera is – to me at least – an act of urban anthropology and historical collecting. 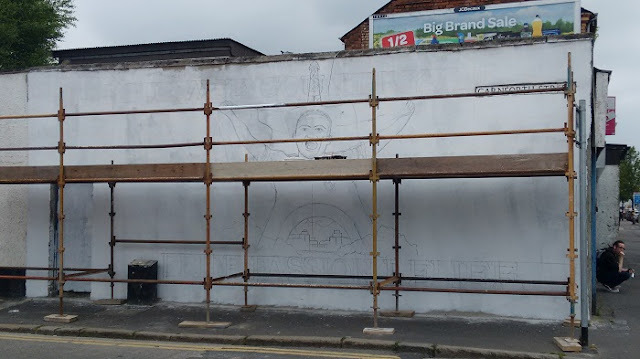 Putting these images in the public sphere gained a somewhat greater urgency in recent times as – over the last week or so – the buildings further along the street from here are being demolished. For now at least, the two buildings closest to the camera are under no threat, but it does underline the fragility and ephemerality of this form of decoration and cultural comment. As it turns out, the unfinished mural – complete with blurred-out artist – was caught by the Google Street View camera. 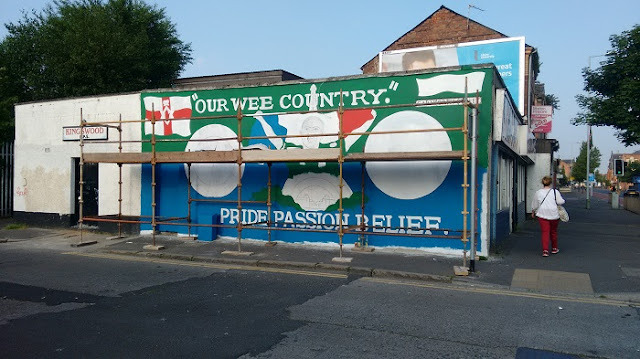 Judging by the degree of completeness, the image appears to have been captured on June 6th. One of four bracelets from a hoard found at New Ross, Co. Wexford. The pieces are dated to the period from 800-700 BC. 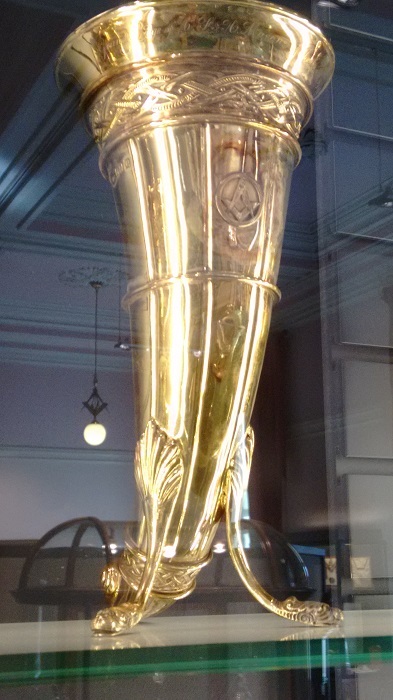 Currently on display at the National Museum of Ireland, Dublin. 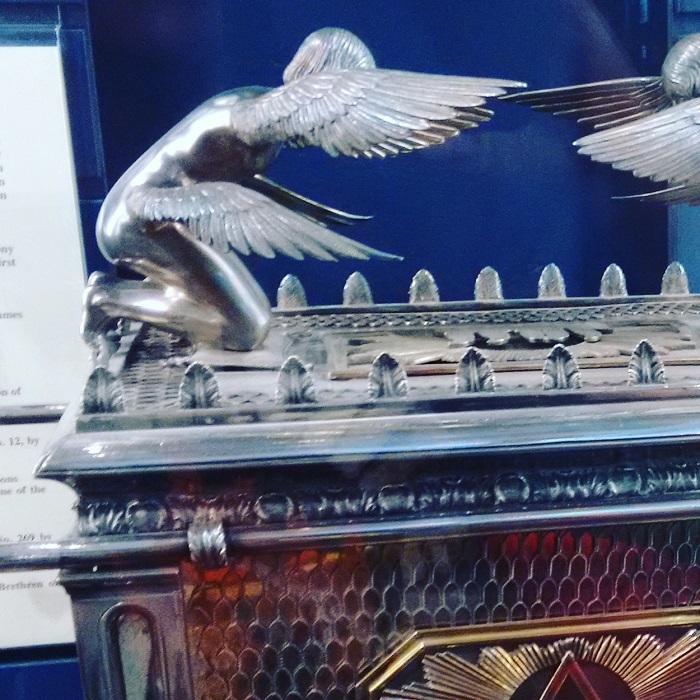 In a previous post, I spoke about the rather wonderful silver replica of the Ark of the Covenant housed in the museum at the Grand lodge of Ireland, Molesworth Street, Dublin. In between engagements gracing the altar at meetings of Grand Lodge, the model is on display on the bottom shelf of the cabinet in the far wall of the museum. 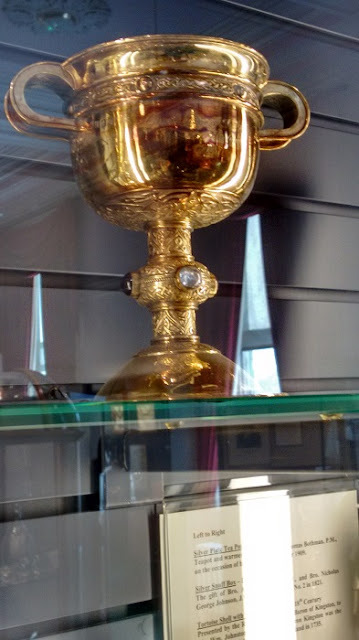 I mention this because I have frequently visited the museum and gazed upon the beauty of this piece, but have failed to notice some of the other pieces in the same cabinet. In particular, on the topmost shelf there is a delightful collection of silver gilt pieces that should be of interest to both archaeologists and Freemasons. The three pieces – two chalices and a drinking horn – were made by William Stokes in Dublin in 1909. They were intended to be used in the consecration of new Lodges. 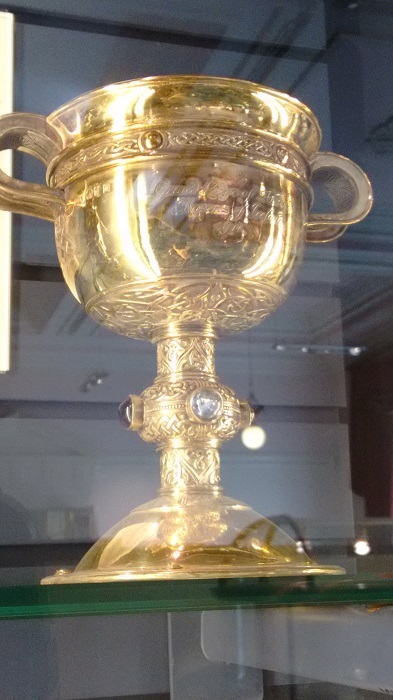 The museum’s information card indicates that the chalices were influenced by the Ardagh Chalice (now housed just around the corner in the National Museum of Ireland). The parallels are particularly clear in the form of the handles, the foot, the studded band of interlace passing through the handles and the largely plain bowl. 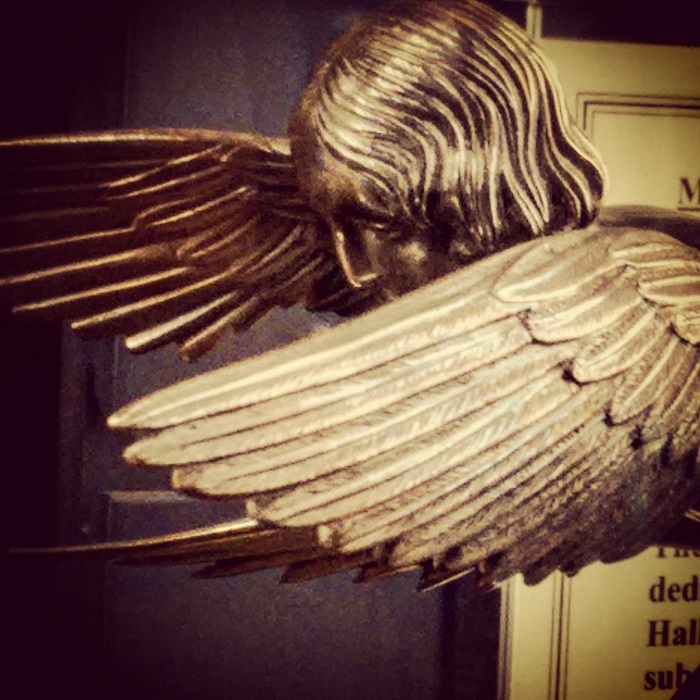 However, the proportions are completely altered, mostly by the knopped neck that bears no resemblance to the original, seemingly taking more inspiration from medieval and later examples. If you’re being picky, you could note that the bowl is missing the escutcheons under the handles and the roundel on the body of the bowl is replaced with a copperplate inscription. Still, they are a beautiful pair of chalices. 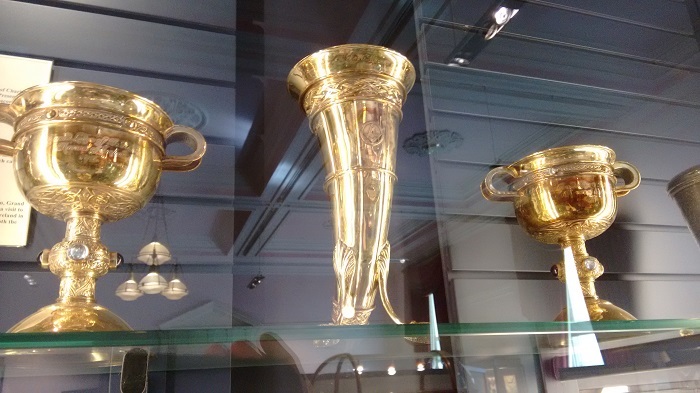 Although taking the central place on the top shelf between the two chalices, the museum’s information card doesn’t appear to mention the beautiful drinking horn at all. 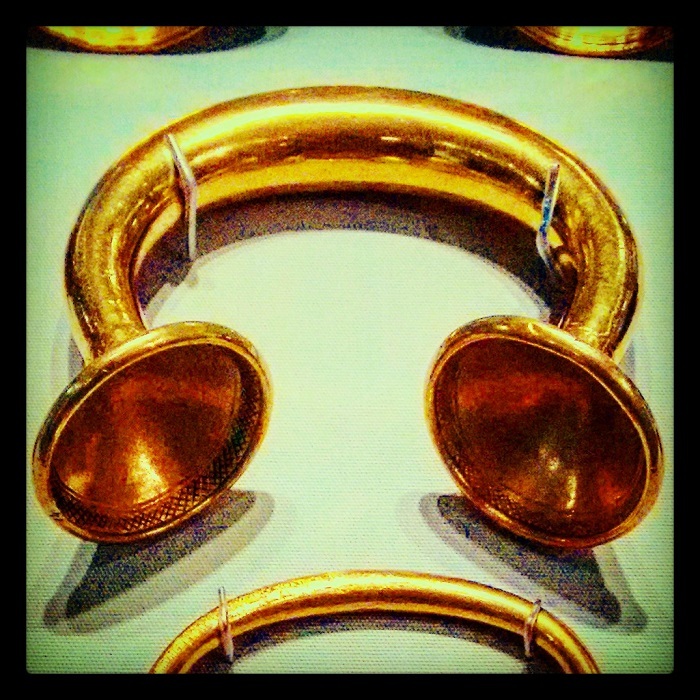 Although quite different to the Kavanagh Charter Horn (also housed at the National Museum of Ireland), it would appear to be the most likely Irish inspiration for the horn shape, if not the actual decorative motifs themselves. 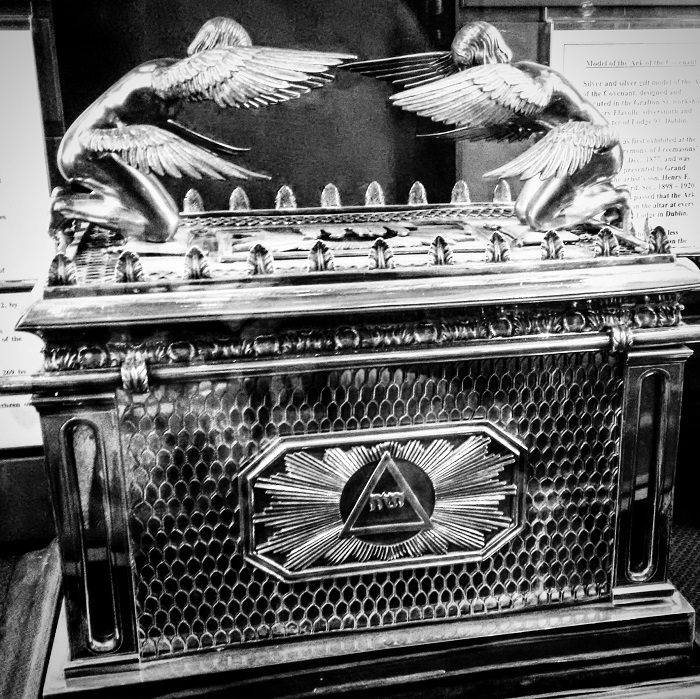 In any case, it too is a beautiful piece of craftsmanship and worth a trip to the Masonic museum to see … and then to the National Museum of Ireland to make your own comparisons! Entry to the museum is free and is open to the public Monday to Friday throughout the year. Who knows. Perhaps the Ark is still waiting in some antechamber for us to discover. Of all of the wonderful treasures held in the museum at the Grand lodge of Ireland, Molesworth Street, Dublin, the Ark of the Covenant is my absolute favourite. It’s fabricated in solid silver and silver gilt by Henry Flavelle. His silversmiths workshop was located on Grafton St., Dublin and he also served as Worshipful Master of Lodge 93 in Dublin. The model was first exhibited in December 1877 at the dedication ceremony for Freemasons’ Hall. 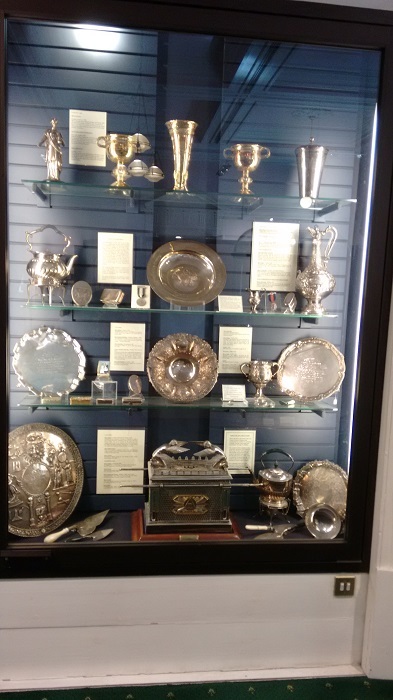 It was eventually gifted to Grand Lodge by Henry E Flavelle the silversmith’s son, who served as Deputy Grand Secretary from 1898 to 1920. The Ark is now placed on the altar at every meeting of the Grand Lodge in Dublin. It’s a fantastic piece of sculpture and artistry, and I urge you to go see it yourself if you get the chance! The title of this post is, of course, from 1981’s Raiders of the Lost Ark and the words are spoken by Belloq. Did you really think I was going to write about the Ark of the Covenant and not reference this?